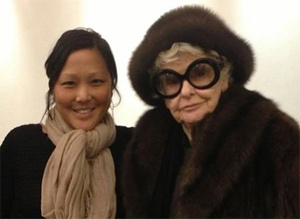 In her film Elaine Stritch: Shoot Me, first-time director Chiemi Karasawa, who worked for many years as a producer, gets up close and personal with Stritch. Her documentary revels in Stritch’s talent and personality, but doesn’t flinch from showing that growing old isn’t easy — even for Broadway stars. Watching your film, it’s difficult not to think that you might have had a tough time filming someone who’s so strongly opinionated. Chiemi Karasawa: Initially, it was pretty tricky. It’s tricky for anyone to get used to having a camera around all the time. ... Elaine knows what she likes, and she knows what she feels comfortable doing. Once she began to see the cameraman as a human being, it was like she didn’t care anymore. She wanted the camera around because she wanted us around. That happened in the first couple of weeks. Over the years, I’ve heard a lot of stories about how films began. But I don’t think I’ve ever heard of a documentary that was born in a hair salon. CK: I was in a hair salon on 57th street. I saw Elaine crossing at the color station. My hairdresser said she was a long-time client. He suggested that I make a documentary about her. I went home, did some research and wondered why I didn’t know more about her. What would you say is her most essential characteristic? To this day, she’s the most unpredictable person I’ve ever met. That’s one of the joys and frustration of dealing with her. It also makes her a fascinating documentary subject. You began financing your film with a crowd-source campaign. Can you tell us about that? CK: We did an Indiegogo campaign. I raised 40 percent of the money for development that way, and it brought us a lot of attention. But the movie also brought us to the attention of Alec Baldwin. (He plays Stritch’s son on 30 Rock and is interviewed in the film.) He asked how much we needed, and helped us to finish the film. He became the film’s executive producer and hosted our premiere in New York City. Do you still see Elaine? CK: Yes. She was just in New York City for the press tour. She moved back to Birmingham, Mich. I’ve probably been to see her four times in the last year. She’s a close person and friend in my life. Why did she leave New York, a place with which she’s so identified? CK: It was becoming increasingly difficult for her to live alone. The cost of living in New York with a full-time care giver was a concern. But she also recognizes that her life is winding down and that she needs to take more time for herself. To her, New York always represented a workplace. Her idea was to be closer to her family. She wanted to reach out to them and live in an environment that was about family than career. How has she reacted to the film? CK: I showed her a rough cut on a laptop on her bed in the Carlyle Hotel. (Stritch lived there for years.) She was really compelled by it. She watched herself in third person, as if she didn’t know what would happen next. When I showed it on the screen with a small audience, she was nervous and unsettled. She didn’t know how her fans would take it. Seeing her in a vulnerable state, I had to reassure her that people’s responses were favorable. Thankfully, she gave me the honor of making the film I wanted to make. That’s the greatest gift she could have allowed.